Obituary for Abdul-Raheem Salih Rashid | Langeland Family Funeral Homes, Inc.
Abdul-Raheem Salih Rashid (born Robert Earl Gaston) was born to the union of Emma Bogan-Gaston and Robert Gene Gaston on June 25, 1943, in Okolona, MS. He joined the "ORIGINAL NATION OF ISLAM" under Elijah Muhammad in 1971 and later became a minister (referred to as Imam) in 1972, under the leadership of Philbert Omar. Raheem became a founding member of the first temple in Kalamazoo MI, in 1973 and in 1975, he accepted the transition of Wallace Muhammad as the new leader of the Nation of Islam, including the new orientation toward Al-Islam as practiced by the Nation of Muslims in 1976. As Imam, Raheem became active in various committees in Kalamazoo MI, where he represented the residents on the Northside of Kalamazoo. Prison ministry was also a part of the activities he participated in as an Imam under the guidance of Imam Warith Deen Mohammed. As a Financial Manager, Mr. Rashid sold financial services in 6 states: Alabama, Georgia, Illinois, Michigan, Mississippi, and Missouri. 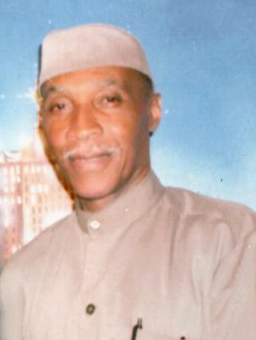 In the year of 1994, Raheem founded "Tam Distributing Company" and represented the company in the 1996 Olympics in Atlanta, GA. As an active member of the Islamic community, he hosted Imam Warith Deen Mohammed in a "Community Awareness Day"; co-presented Muhammad Ali and his manager Jabbir Muhammad Life Time Awards. Mr. Rashid also met and interacted with several famous people such as Reverend Jessie Jackson, Richard Pryor, Minister Louis Farrakhan, Imam Jamil El-Amin (H. Rap Brown), Chuck D. (founder of Public Enemy), and Fred Meijer (Meijer stores). Raheem participated in the Atlanta project which was founded by former president Jimmy Carter. Abdul-Raheem S. Rashid was proceeded in death by his parents, Mr. & Mrs. Robert Gene Gaston, his sister, Bessie Coleman and his brother, Ricky Jeffrey. Leaving to cherish his memories are three sons: Anthony (Amanda) Jones and Robert Dunigan (Michigan), Tahir Rashid (Florida); two daughters JoAnna (Eldon) Dorrington (Michigan) and Angela Cleveland (Georgia); four sisters: Janice (Randy) Brown (Georgia), Charlotte Jeffrey (Wisconsin), and Jeanette (Jerome) Parker (Michigan), Judi (Gregory) James (Michigan); one brother, Larry Easter (Michigan) and one step-sister Rosie (Leonard) Rogers (Indiana); a special aunt Mary Kate Gibson of Kalamazoo; 16 grandchildren, 19 great-grandchildren, 3 great-great-grandchildren and a host of other relatives and friends.